Cleaning tile floors by hand is not easy. It is dirty, unpleasant, and impossible to get the deep-clean results that come with our professional tile and grout cleaning. The reason it is such an unattainable feat is because grout is a porous material. This means it collects dirt, grime, and spills, often discoloring the surface and leaving stains. Regular mopping and cleaning doesn’t reach the dirt that falls deep within the pores of the grout and becomes hidden. 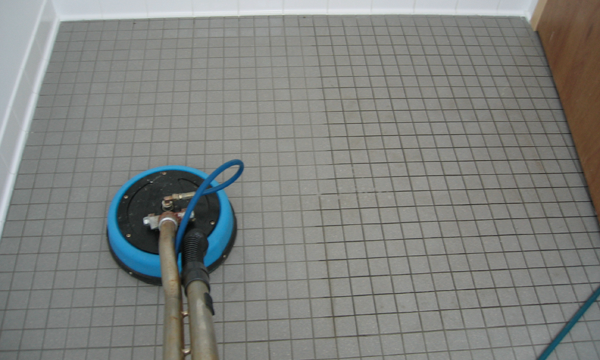 Our professional tile and grout cleaning service restores the shine to your floors. High-powered service achieves better results than cleaning by hand could ever do. We remove all dry soil and debris. Safe and gentle on your floors, my cleaning wand is highly effective. Biological pollutants were or are living organisms. Their presence creates reduced indoor air quality. Some can damage surfaces. Biological pollutants can travel through the air and are virtually invisible. Common indoor biological pollutants are animal dander (scales from feathers, skin, and hair), dust mite parts, fungi, molds, infectious agents like bactertia or viruses, and pollen. Some of these are in every home, and it’s not possible to be clear of them all. Two conditions are essential to promote biological growth: nutrients and moisture. These conditions can be found in bathrooms, damp or flooded basements, humidifiers and air conditioners, and carpets and furniture. Modern construction advances reduce the amount of outside air entering a particular structure, aiding the build up of high moisture levels inside. Always vacuum or sweep before mopping, eliminating as much debris as possible. Rinse after you mop, to avoid any lingering detergents that may stay on the surface of your tile. Avoid bleach and other harsh chemical cleaners that might break down sealants that can allow liquids and solids permeate the grout causing discoloration and stains. We are fully insured. We service everywhere. We have a portable service and perform in-house restorations. Call Jason for more information. Wisconsin and Illinois. Green County, Dane County, Rock County, Iowa County, Lafayette County, Winnebago County, Stephenson County, Jo Daviess County, Carroll County, Ogle County, Boone County. Monroe WI, New Glarus WI, Madison WI, Middleton WI, Mount Horeb WI, Verona WI, Fitchburg WI, Stoughton WI, McFarland WI, Oregon WI, Belleville WI, Mineral Point WI, Darlington WI, Brodhead WI, Albany WI, Dayton WI, Janesville WI, Dodgeville WI, Beloit WI. Dubuque IA, Galena IL, Freeport IL, Rockford IL, Lena IL, Lake Summerset IL, Lanark IL, Orangeville IL, Cedarville IL.